This article is about the city in Slovakia. For other uses, see Kosice. Košice (Slovak pronunciation: [ˈkɔʃitsɛ]) is the largest city in eastern Slovakia and in 2013 was the European Capital of Culture (together with Marseille, France). It is situated on the river Hornád at the eastern reaches of the Slovak Ore Mountains, near the border with Hungary. 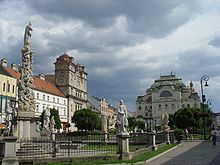 With a population of approximately 240,000 Košice is the second largest city in Slovakia after the capital Bratislava. The first written mention of the city was in 1230 as "Villa Cassa". The Slovak name of the city comes from the Slavic personal name Koša with the patronymic Slavic suffix "-ice". The city may derive its name from Old Slovak kosa, "clearing", related to modern Slovak kosiť, "to reap". Though according to other sources the city name may derive from an old Hungarian first name which begins with "Ko". The first evidence of inhabitance can be traced back to the end of the Paleolithic era. The first written reference to the Hungarian town of Kassa (as the royal village – Villa Cassa) comes from 1230. After the Mongol invasion in 1241, King Béla IV of Hungary invited German colonists to fill the gaps in population. The city was in the historic Abauj County of the Kingdom of Hungary. The city was made of two independent settlements: Lower Kassa and Upper Kassa, amalgamated in the 13th century around the long lens-formed ring, of today's Main Street. The first known town privileges come from 1290. The city grew quickly because of its strategic location on an international trade route from agriculturally rich central Hungary to central Poland, itself along a greater route connecting the Balkans and the Adriatic and Aegean seas to the Baltic Sea. The privileges given by the king were helpful in developing crafts, business, increasing importance (seat of the royal chamber for Upper Hungary), and for building its strong fortifications. In 1307, the first guild regulations were registered here and were the oldest in Kingdom of Hungary. As a Hungarian free royal town, Kassa reinforced the king's troops in the crucial moment of the bloody Battle of Rozgony in 1312 against the strong aristocratic Palatine Amadé Aba (family). In 1347, it became the second place city in the hierarchy of the Hungarian free royal towns with the same rights as the capital Buda. In 1369, it received its own coat of arms from Louis I of Hungary. The Diet convened by Louis I in Kassa decided that women could inherit the Hungarian throne. "Cassovia: Superioris Hungariae Civitas Primaria", the prospect from Civitates orbis terrarum. Cassovia (Slovak: Košice, German: Kaschau, Hungarian: Kassa), the "capital" of Upper Hungary in 1617. The significance and wealth of the city in the end of the 14th century was mirrored by the decision to build a completely new church on the grounds of the previously destroyed smaller St. Elisabeth Church. The construction of the biggest cathedral in the Kingdom of Hungary – St. Elisabeth Cathedral – was supported by the Emperor Sigismund, and by the apostolic see itself. Since the beginning of the 15th century, the city played a leading role in the Pentapolitana – the league of towns of five most important cities in Upper Hungary (Bártfa, Locse, Kassa, Eperjes, and Kisszeben). During the reign of King Hunyadi Mátyás the city reached its medieval population peak. With an estimated 10,000 Hungarian inhabitants, it was among the largest medieval cities in Europe. The history of Kassa was heavily influenced by the dynastic disputes over the Hungarian throne, which together with the decline of the continental trade brought the city into stagnation. Vladislaus III of Varna failed to capture the city in 1441. John Jiskra's mercenaries from Bohemia defeated Tamás Székely's Hungarian army in 1449. John I Albert, Prince of Poland, could not capture the city during a six-month-long siege in 1491. In 1526, the city homaged for Ferdinand I, Holy Roman Emperor. John Zápolya captured the city in 1536 but Ferdinand I reconquered the city in 1551. In 1554, the settlement became the seat of the Captaincy of Upper Hungary. In 1604, Catholics seized the Lutheran church in Kassa. The Calvinist Stephen Bocskay then occupied Kassa during his Protestant, Ottoman-backed insurrection against the Habsburg dynasty. The future George I Rákóczi joined him as a military commander there. Giorgio Basta, commander of the Habsburg forces, failed in his attempt to capture the city. At the Treaty of Vienna (1606), in return for giving territory including Kassa back, the rebels won the Hapsburg concession of religious toleration for the Magyar nobility and brokered an Austrian-Turkish peace treaty. Stephen Bocskay died in Kassa on December 29, 1606 and was interred there. For some decades during the 17th century Kassa was part of the Principality of Transylvania, and consequently a part of the Ottoman Empire and was referred to as Kaşa in Turkish. On September 5, 1619, the prince of Transylvania, Gabriel Bethlen captured Kassa with the assistance of the future George I Rákóczi in another anti-Habsburg insurrection. By the Peace of Nikolsburg in 1621, the Habsburgs restored the religious toleration agreement of 1606 and recognized Transylvanian rule over the seven Partium countries: Ugocsa, Bereg, Zemplén, Borsod, Szabolcs, Szatmár and Abaúj (including Kassa). Bethlen married Catherine von Hohenzollern, of Johann Sigismund Kurfürst von Brandenburg, in Kassa in 1626. Bethlen married Catherine von Hohenzollern, of Johann Sigismund Kurfürst von Brandenburg, in Košice in 1626. Kassa and the rest of the Partium were returned to the Hapsburgs after Bethlen's death, which took place in 1629. On January 18, 1644, the Diet in Kassa elected George I Rákóczi the prince of Hungary. He took the whole of Upper Hungary and joined the Swedish army besieging Brno for a projected march against Vienna. However, his nominal overlord, the Ottoman Sultan, ordered him to end the campaign but he did so with gains. In the Treaty of Linz (1645), Kassa returned to Transylvania again as the Hapsburgs recognized George's rule over the seven counties of the Partium. He died in 1648, and Kassa was returned to the Hapsburgs once more. Kassa became a center of the Counter-Reformation. In 1657, a printing house and university were founded by the Jesuits, funded by Leopold I Hapsburg. The 1664 Peace of Vasvár at the end of the Austro-Turkish War (1663-1664) awarded Szabolcs and Szatmár counties to the Hapsburgs, which put Kassa further inside the border of Royal Hungary again. A modern pentagonal fortress (citadel) was built by the Habsburgs south of the city in the 1670s. The city was besieged by Kuruc armies several times in the 1670s and it revolted against the Habsburg emperor. The rebel leaders were massacred by emperor's soldiers on November 26, 1677. Another rebel leader, Imre Thököly captured the city in 1682, making Kaşa once again a vassal territory of Ottoman Empire under Principality of Upper Hungary until 1686. The Austrian field marshal Aeneas de Caprara got Kassa back from Ottoman Turks on late-1685. In 1704–1711 Prince of Transylvania Francis II Rákóczi made Košice the main base in his War for Independence. The fortress was demolished by 1713. When not under Ottoman suzerainty, Kassa was the seat of the Hapsburg "Captaincy of Upper Hungary" and the seat of the Chamber of Szepes County (Spiš, Zips), which was a subsidiary of the supreme financial agency in Vienna responsible for Upper Hungary). Due to Ottoman occupation of Eger, Kassa was the residence of Eger's archbishop from 1596 to 1700. From 1657, it was the seat of the historic Royal University of Kassa (Universitas Cassoviensis), founded by Bishop Benedict Kishdy. The university was transformed into a Royal Academy in 1777, then into a Law Academy in the 19th century. It ceased to exist in the turbulent year of 1921. After the end of the anti-Habsburg uprisings in 1711 the victorious Austrian armies drove the Ottoman forces back to the south and this major territorial change created new trade routes which circumvented Košice. The city began to decay and turned from a rich medieval town into a provincial town known for its military base and dependent mainly on agriculture. In 1723, the Immaculata statue was erected in the place of a former gallows at Hlavná ulica (Main Street) commemorating the plague from the years 1710–1711. This was one of the centers of the Hungarian language regenerate movement which published the first Hungarian language periodical called the Magyar Museum in Hungary in 1788. The city's walls were demolished step by step from the early 19th century to 1856; only the Executioner's Bastion remained with few parts of the wall. The city became the seat of its own bishopric in 1802. The city's surroundings became a theater of war again during the Revolutions of 1848, when the Imperial cavalry general Franz Schlik defeated the Hungarian army on December 8, 1848 and January 4, 1849. The city was captured by the Hungarian army on February 15, 1849, but the Russian troops drove them back on June 24, 1849. In 1828, there were three manufacturers and 460 workshops. The first factories were established in the 1840s (sugar and nail factories). The first telegram message arrived in 1856 and the railway connected the city to Miskolc in 1860. In 1873, there were already connections to Eperjes, Zsolna, and Csop (in today's Ukraine). The city gained a public transit system in 1891 when track was laid down for a horse-drawn tramway. The traction was electrified in 1914. In 1906, Francis II Rákóczi's house of Rodostó was reproduced in Kassa and his remains were buried in the St. Elisabeth Cathedral. After World War I and during the gradual break-up of Austria-Hungary, the city at first became a part of the transient "Eastern Slovak Republic", declared on December 11, 1918 in Košice and earlier in Prešov under the protection of Hungary. On December 29, 1918, the Czechoslovak Legions entered the city, making it part of the newly established Czechoslovakia. However, in June 1919, Košice was occupied again, as part of the Slovak Soviet Republic, a proletarian puppet state of Hungary. The Czechoslovak troops secured the city for Czechoslovakia in July 1919, which was later upheld under the terms of the Treaty of Trianon in 1920. Jews had lived in Košice since the 16th century but were not allowed to settle permanently. There is a document identifying the local coiner in 1524 as a Jew and claiming that his predecessor was a Jew as well. Jews were allowed to enter the city during the town fair, but were forced to leave it by night, and lived mostly in nearby Rozunfaca. In 1840 the ban was removed, and before that there were a few Jews living in the town, among them a widow who ran a small Kosher restaurant for the Jewish merchants passing through the town. Košice was ceded to Hungary, by the First Vienna Award, from 1938 until early 1945. The town was bombarded on June 26, 1941 by a still unidentified aircraft, in what became a pretext for the Hungarian government to declare war on the Soviet Union a day later. The German occupation of Hungary led to the deportation of Košice's entire Jewish population of 12,000 and an additional 2,000 from surrounding areas via cattle cars to the concentration camps. Today[when?] there are only 8 men who pray at the synagogue regularly, and they are assisted by Jewish students predominantly studying medicine at the city's universities, from Israel. The town was captured by the Soviets in January 1945 and for a short time it became a temporary capital city of the restored Czechoslovak Republic until the Soviet Red Army reached Prague. Among other acts, the Košice Government Program was declared on April 5, 1945. At that time a large population of ethnic Germans in the area were expelled and sent on foot to Germany or to the Russian border. Following the Velvet Divorce and creation of the Slovak Republic, Košice became the second largest city in the country and became a seat of a constitutional court. Since 1995, it has been the seat of the Archdiocese of Košice. Košice lies at an altitude of 206 metres (676 ft) above sea level and covers an area of 242.77 square kilometres (93.7 sq mi). It is located in eastern Slovakia, about 20 kilometres (12 mi) from the Hungarian, 80 kilometres (50 mi) from the Ukrainian, and 90 kilometres (56 mi) from the Polish borders. It is about 400 kilometres (249 mi) east of Slovakia's capital Bratislava and a chain of villages connects it to Prešov which is about 36 kilometres (22 mi) to the north. Košice is on the Hornád River in the Košice Basin, at the easternmost reaches of the Slovak Ore Mountains. More precisely, it is a subdivision of the Čierna hora mountains in the northwest and Volovské vrchy mountains in the southwest. The basin is met on the east by the Slanské vrchy mountains. Košice has a humid continental climate (Köppen: Dfb), as the city lies in the north temperate zone. The city has four distinct seasons. Precipitation varies little throughout the year with abundance precipitation that falls during summer and only few during winter. The coldest month is January, with an average temperature of −2.6 °C (27.3 °F), and the hottest month is July, with an average temperature of 19.3 °C (66.7 °F). Košice has a population of 240,688 (December 31, 2011). According to the 2011 census, 73.8% of its inhabitants were Slovaks, 2.65% Hungarians, 2% Romani, 0.65% Czechs, 0.68% Rusyns, 0.3% Ukrainians, and 0.13% Germans. 19% of Košice's population did not declare their ethnic affiliation in the 2011 census. The religious makeup was 45% Roman Catholics, 16.6% people with no religious affiliation, 6.12% Greek Catholics, and 2.33% Lutherans, 2% Calvinists and 0.11% Jews. According to the researchers the town had a German majority until the mid-16th century, and by 1650, 72.5 percent of the population may have been Hungarians,[note 1] 13.2 percent was German, 14.3 percent was Slovak or of uncertain origin. The Ottoman Turkish traveler Evliya Çelebi mentioned that, the city was inhabited by "Hungarians, Germans, Upper Hungarians" in 1661 when the city was under suzerainty of Ottoman Empire and under Turkish control. The linguistic makeup of the town's population underwent historical changes that alternated between a growth of the ratio of those who claimed Hungarian and those who claimed Slovak as their language. With a population of 28,884 in 1891, just under half (49.9%) of the inhabitants of Košice declared the then official Hungarian language as their main means of communication, 33.6% Slovak, and 13.5% German; 72.2% were Roman Catholics, 11.4% Jews, 7.3% Lutherans, 6.7% Greek Catholics, and 4.3% Calvinists. The results of this census are questioned by some historians by claiming that they were manipulated, in order to increase the percentage of the Magyar population in the period of Magyarization. This is disputed. By the 1910 census, which is sometimes accused of being manipulated by the ruling Hungarian bureaucracy, 75.4% of the 44,211 inhabitants claimed Hungarian, 14.8% Slovak, 7.2% German, and 1.8% Polish. The Jews were split among other groups by the 1910 census, as only the most frequently used language and not ethnicity was registered. The population (around 1910) is multidenominational and multiethnical, and the differences in the level of education mirrors the stratification of society, following these facts. http://mek.oszk.hu/16900/16992 The linguistic balance within the town limits began to shift towards Slovak after World War I with Slovakization in the newly established Czechoslovakia. As a consequence of the First and Second Vienna Awards, Košice was ceded to Hungary. During the German occupation of Hungary towards the end of World War II, approximately 10,000 Jews were deported by the Arrow Cross Party and the Nazis, and killed in Auschwitz. The ethnic makeup of the town was dramatically changed by persecution of the town's large Hungarian majority (population exchanges between Hungary and Slovakia and slovakization) and by mass immigration of Slovaks into newly built communist-block-microdistricts, which increased the population of Košice four-times by 1989 and made it the fastest growing city in Czechoslovakia. There are several theatres in Košice. The Košice State Theater was founded in 1945 (then under the name of the East Slovak National Theater). It consists of three ensembles: drama, opera, and ballet. Other theatres include the Marionette Theatre and the Old Town Theatre (Staromestské divadlo). The presence of Hungarian and Roma minorities makes it also host the Hungarian "Thália" theatre and the professional Roma theatre "Romathan". Košice is the home of the State Philharmonic Košice (Štátna filharmónia Košice), established in 1968 as the second professional symphonic orchestra in Slovakia. It organizes festivals such as the Košice Music Spring Festival, the International Organ Music Festival, and the Festival of Contemporary art. Some of the museums and galleries based in the city include the East Slovak Museum (Vychodoslovenské múzeum), originally established in 1872 under the name of the Upper Hungarian Museum. The Slovak Technical Museum (Slovenské technické múzeum) with planetarium, established in 1947, is the only museum in the technical category in Slovakia that specializes in the history and traditions of science and technology. The East Slovak Gallery (Východoslovenská galéria) was established in 1951 as the first regional gallery with the aim to document artistic life in present-day eastern Slovakia. Kasárne Kulturpark – 19th-century military barracks turned into new urban space with a centre of contemporary art, exhibition and concert halls and workshops for creative industry. Kunsthalle – a 1960s disused swimming pool turned into the first Kunsthalle in Slovakia. SPOTs – 1970s and 1980s disused heat exchangers turned into cultural "spots" in Communist-Era-block-of-flats districts. City park, Park Komenského and Mojzesova – revitalisation of urban spaces. Castle of Košice, Amfiteáter, Mansion of Krásna, Handicrafts Street – reconstruction. Tabačka – a 19th-century tobacco factory turned into a centre of independent culture. The first and the oldest international festival of local TV broadcasters (founded in 1995) – The Golden Beggar, takes place every year in June in Košice. The oldest evening newspaper is the Košický večer. The daily paper in Košice is Korzár. Recently, the daily paper Košice:Dnes (Košice:Today) came into existence. TV stations based in Košice: TV Naša, TV Region and public TV broadcaster RTVS Televízne štúdio Košice. Košice is the economic hub of eastern Slovakia. It accounts for about 9% of the Slovak gross domestic product. The steel mill, U.S. Steel Košice with 13,500 employees, is the largest employer in the city and the largest private employer in the country. The second-largest employer in the east of the country is T-Systems Slovakia. It was established and has been based in Košice since 2006. T-Systems Slovakia had 3,850 employees in Košice at the end of 2016, which makes it the second-largest shared service center in Slovakia and one of the top fifteen largest employers in Slovakia. As part of the growing ICT field, Košice IT Valley association was established in 2007 as a joint initiative of educational institutions, government and leading IT companies. In 2012 it was transformed into the cluster. In 2018 the cluster was for the second time certified for “Cluster Management Excellence Label GOLD” as the first in central Europe and is one of three certified clusters in the area of information and communication technologies.Other major sectors include mechanical engineering, food industry, services, and trade. GDP per capita in 2001 was €4,004, which was below Slovakia's average of €4,400. The unemployment rate was 8.32% in November 2015, which was below the country's average 10.77% at that time. The city has a balanced budget of 2.78 billion Slovak korunas (almost €83 million, as of 2007[update]) with a small surplus of 25 million korunas. The budget for the year 2008 consisted of projects with total spending of 2.82 billion korunas. The city centre, and most historical monuments, are located in or around the Main Street (Hlavná ulica) and the town has the largest number of protected historical monuments in Slovakia. The most dominant historical monument of the city is Slovakia's largest church, the 14th century Gothic St. Elisabeth Cathedral; it is the easternmost cathedral of western style Gothic architecture in Central Europe, and is the cathedral of the Archdiocese of Košice. In addition to St. Elisabeth, there is the 14th century St. Michael Chapel, the St. Urban Tower, and the Neo-baroque State Theater in the center of town. The Executioner's Bastion and the Mill Bastion are the remains of the city's previous fortification system. The Church of the Virgin Mary's Birth is the cathedral for the Greek Catholic Eparchy of Košice. Other monuments and buildings of cultural and historical interest are; the old Town Hall, the Old University, the Captain's Palace, Liberation Square, as well as a number of galleries (the East Slovak Gallery) and museums (the East Slovak Museum). There is a Municipal Park located between the historical city centre and the main railway station. The city also has a zoo located northwest of the city, within the borough of Kavečany. Košice is the seat of the Košice Region and since 2002 it is the seat of the autonomous Košice Self-governing Region. Additionally, it is the seat of the Slovak Constitutional Court. The city hosts a regional branch of the National Bank of Slovakia (Národná banka Slovenska) and consulates of Hungary, Belgium, Spain, Russia and Turkey. The local government is composed of a mayor (Slovak: primátor), a city council (mestské zastupiteľstvo), a city board (mestská rada), city commissions (Komisie mestského zastupiteľstva), and a city magistrate's office (magistrát). The directly elected mayor is the head and chief executive of the city. The term of office is four years. The previous mayor, František Knapík, was nominated in 2006 by a coalition of four political parties KDH, SMK, and SDKÚ-DS. In 2010 he finished his term of office. The present mayor is Ing. Jaroslav Polaček. He was inaugurated on December 10, 2018. Košice is the second university town in Slovakia, after Bratislava. The Technical University of Košice is its largest university, with 16,015 students, including 867 doctoral students. A second major university is the Pavol Jozef Šafárik University, with 7,403 students, including 527 doctoral students. Other universities and colleges include the University of Veterinary Medicine in Košice (1,381 students) and the private Security Management College in Košice (1,168 students). Additionally, the University of Economics in Bratislava, the Slovak University of Agriculture in Nitra, and the Catholic University in Ružomberok each have a branch based in the city. There are 38 public elementary schools, six private elementary schools, and three religious elementary schools. Overall, they enroll 20,158 pupils. The city's system of secondary education (some middle schools and all high schools) consist of 20 gymnasia with 7,692 students, 24 specialized high schools with 8,812 students, and 13 vocational schools with 6,616 students. Public transport in Košice is managed by Dopravný podnik mesta Košice (literally the Public transport Company of the city of Košice). The municipal mass transit system is the oldest one in present-day Slovakia, with the first horse-car line beginning operation in 1891 (electrified in 1914). Today, the city's public transportation system is composed of buses (in use since the 1950s), trams, and trolleybuses (since 1993). Košice railway station is a rail hub of eastern Slovakia. The city is connected by rail to Prague, Bratislava, Prešov, Čierna nad Tisou, Humenné, Miskolc (Hungary), and Zvolen. There is a broad gauge track from Ukraine, leading to the steel mill southwest of the city. The D1 motorway connects the city to Prešov and more motorways and roads are planned around the city. Košice International Airport is located south of the city. Regular direct flights from the airport are available to: London, Doncaster/Sheffield, Bratislava, Vienna, Warsaw, Tel Aviv, Kiev, Istanbul and Prague. Regular flights are provided by Czech Airlines, Austrian Airlines, Danube Wings, Turkish Airlines, LOT Polish Airlines and Wizz Air and in code-share by KLM-Air France, Delta, Lufthansa, United and Etihad. At its peak in year 2008, it served 590,919 passengers but the number has since declined. The oldest annual marathon in Europe and the third oldest in the entire world, after the world-famous Boston Marathon and the Yonkers Marathon. Košice Peace Marathon (founded in 1924.) is run in the historic part of the city organized every year on the first Sunday of October. Ice hockey club HC Košice is one of the most successful Slovak hockey clubs. It plays in Slovakia's highest league, the Extraliga, and has won eight titles in 1995, 1996, 1999, 2009, 2010, 2011, 2013, and 2015; and two titles (1986 and 1988) in the former Czechoslovak Extraliga. Since 2006, their home is the Steel Aréna which has a capacity of 8,343 spectators. Football club MFK Košice currently plays in the Corgoň Liga. It was the first club from Slovakia reach the group stages of the UEFA Champions League and is a two times domestic league winner (1998 and 1999). After relegation in 2003, the club returned to the Corgoň Liga in 2005. Košice, along with Bratislava hosted the 2011 IIHF World Championship in ice hockey. Košice, became the 2016 European City of Sport by the European Capitals of Sports Association (ACES Europe). The sporting events in 2016 included "the International Peace Marathon, several urban runs, a swimming relay contest, the Košice-Tatry- Košice cycling race, the dance sport world championships, the Basketball Euroleague, Volleyball World League and Water Polo World League". ^ Kocsis, Karoly; Kocsis-Hodosi, Eszter (April 1, 2001). "Ethnic Geography of the Hungarian Minorities in the Carpathian Basin". Simon Publications, Incorporated – via Google Books. ^ a b City of Košice (2005). "Short History of Košice". Archived from the original on October 24, 2007. Retrieved February 10, 2008. ^ "Z histórie Košíc – 13. storočie" (in Slovak). City of Košice. 2005. Archived from the original on June 27, 2007. Retrieved February 10, 2008. ^ Placenames of the world: origins and... – Google Books. Books.google.com. December 31, 2003. Retrieved June 2, 2011. ^ Magyar Nyelvtudományi Társaság (Society of Hungarian Linguistics), Magyar nyelv, Volume 18, Akadémiai Kiadó, 1922, p. 142, Cited: "Kokos (Kakas), Kolumbán (Kálmán), Kopov (Kopó), Kokot (Kakat hn.) stb. Bármely ilyen Ko- szótagon kezdődő tulajdonnévnek lehet a Kosa a származéka. E Kosa szn. van nézetünk szerint Kassa (régen Kossa -=: Kosa) város nevében is/Kokos (Kakas), Kolumbán (Kálmán), Kopov (Kopó), Kokot (Kakat hn.) etc., any proper nouns that begin with 'Ko' syllable may have Kosa derivative, in the name of Kassa as well (it's old form Kossa, Kosa)"
^ Vlastivedný Slovník Obcí na Slovensku, VEDA, vydavateľstvo Slovenskej akadémie vied, Bratislava 1978. ^ Milan Majtán (1998), Názvy Obcí Slovenskej republiky (Vývin v rokoch 1773–1997), VEDA, vydavateľstvo Slovenskej akadémie vied, Bratislava, ISBN 80-224-0530-2. ^ Lelkes György (1992), Mayar Helységnév-Azonosító Szótár, Balassi Kiadó, Budapest, ISBN 963-7873-00-7. ^ a b Papp, Sándor. "Slovakya'nın Tarihi". TDV İslam Ansiklopedisi. 33: 337. Retrieved April 24, 2016. ^ a b "Zaujímave letopočty z dejín mesta Košice – 1143–1560" (in Slovak). City of Košice. 2005. Archived from the original on May 10, 2007. Retrieved February 10, 2008. ^ "Z histórie Košíc – 14. storočie" (in Slovak). City of Košice. 2005. Archived from the original on June 25, 2007. Retrieved February 10, 2008. ^ Rady, Martyn C. (2000). Nobility, land and service in medieval Hungary. University of London. p. 51. ISBN 978-0-333-80085-0. ^ "Warfare in Fourteenth Century Hungary, from the Chronica de Gestis Hungarorum". De Re Militari, an international scholarly association. Archived from the original on September 17, 2011. Retrieved September 24, 2014. ^ "Pallas Nagy Lexikona" (in Hungarian). City of Kassa. Retrieved February 10, 2008. ^ Mahoney, William (February 18, 2011). "The History of the Czech Republic and Slovakia". ABC-CLIO – via Google Books. ^ a b c Hötte, Hans H. A. (December 17, 2014). "Atlas of Southeast Europe: Geopolitics and History. Volume One: 1521–1699". BRILL – via Google Books. ^ a.s., Petit Press. "HISTÓRIA". ^ "The Treaty of Vasvár: What Was Lost, and What Remained". mek.oszk.hu. ^ "Z histórie Košíc – 18. storočie" (in Slovak). City of Košice. n.d. Archived from the original on September 25, 2006. Retrieved January 23, 2007. ^ "Immaculata". City of Košice. 2005. Archived from the original on September 25, 2006. Retrieved February 10, 2008. ^ a b c "Zaujímave letopočty z dejín mesta Košice (1657–1938)" (in Slovak). City of Košice. n.d. Archived from the original on May 15, 2007. Retrieved January 20, 2008. ^ "Rákóczi in Košice 1906–2006 – Who was Francis II Rákóczi?". various. February 24, 2006. Archived from the original on February 2, 2009. Retrieved March 3, 2008. ^ a b "Z histórie Košíc – 20. storočie (Slovak)" (in Slovak). City of Košice. 2005. Archived from the original on February 2, 2009. Retrieved January 20, 2008. ^ Dreisziger, Nándor F. (1972). "New Twist to an Old Riddle: The Bombing of Kassa (Košice), June 26, 1941". Journal of Modern History. 44 (2): 232–42. doi:10.1086/240751. ^ "ארכיון בית העדות – תוצאות חיפוש". ^ "Municipal Statistics". Statistical Office of the Slovak republic. Archived from the original on December 17, 2007. Retrieved May 3, 2007. ^ "World Weather Information Service – Košice". July 2011. ^ "Štatistický úrad SR". statistics.sk. ^ Štatistický úrad Slovenskej republiky Archived copy at the Library of Congress (September 10, 2012). ^ Franz Joseph I of Austria and His Empire – Google Knihy. Books.google.com. Retrieved August 13, 2012. ^ Teich, Mikuláš; Dušan Kováč; Martin D. Brown (2011). Slovakia in History. Cambridge University Press. Retrieved September 15, 2011. ^ "Židia v Košiciach" (in Slovak). Retrieved January 26, 2008. ^ KOROTNOKY, Ľudovít (ed.). Košice : sprievodca. Košice : Východoslovenské tlačiarne, 1989. 166 s. ISBN 80-85174-40-5. ^ "Košice – metropola východného Slovenska" (in Slovak). Košice.info. 2008. Retrieved January 29, 2008. ^ "Slovenské technické múzeum – História múzea" (in Slovak). n.d. Retrieved January 29, 2008. ^ "Východoslovenská galéria" (in Slovak). cassovia.sk. n.d. Retrieved January 29, 2008. ^ "Najväčší zamestnávatelia Slovenska". Trend (in Slovak). Archived from the original on January 25, 2008. Retrieved January 24, 2008. ^ a b "Urban Audit". Archived from the original on November 9, 2011. Retrieved January 24, 2008. ^ "Nezamestnanosť – mesačné štatistiky" (in Slovak). Central Office of Labour, Social Affairs and Family. 2015. Retrieved January 8, 2016. ^ "Uznesenie z II. rokovania Mestského zastupiteľstva v Košiciach, zo dňa 22. februára 2007" (RTF) (in Slovak). City of Košice. 2007. Retrieved January 25, 2008. ^ a b "Town monument reserve – Košice". Slovak Tourist Board. 2007. Archived from the original on October 25, 2007. Retrieved January 23, 2007. ^ "František Knapík". Archived from the original on January 20, 2012. Retrieved March 19, 2011. ^ a.s, Petit Press. "Nový košický primátor sľúbil návrat trolejbusov aj protikorupčný audit". kosice.korzar.sme.sk (in Slovak). Retrieved December 10, 2018. ^ "Technická univerzita Košice" (PDF) (in Slovak). Ústav informácií a prognóz školstva. Archived from the original (PDF) on February 27, 2008. Retrieved February 14, 2008. ^ "Univerzita Pavla Jozefa Šafárika" (PDF) (in Slovak). Ústav informácií a prognóz školstva. Archived from the original (PDF) on February 27, 2008. Retrieved February 14, 2008. ^ "Vysoká škola bezpečnostného manažérstva" (PDF) (in Slovak). Ústav informácií a prognóz školstva. Archived from the original (PDF) on February 27, 2008. Retrieved February 14, 2008. ^ a b "Prehľad základných škôl v školskom roku 2006/2007" (PDF) (in Slovak). Ústav informácií a prognóz školstva. 2006. Archived from the original (PDF) on February 27, 2008. Retrieved February 14, 2008. ^ "Prehľad gymnázií v školskom roku 2006/2007" (PDF) (in Slovak). Ústav informácií a prognóz školstva. Archived from the original (PDF) on February 27, 2008. Retrieved February 14, 2008. ^ "Prehľad stredných odborných škôl v školskom roku 2006/2007" (PDF) (in Slovak). Ústav informácií a prognóz školstva. Archived from the original (PDF) on February 27, 2008. Retrieved February 14, 2008. ^ "Prehľad združených stredných škôl v školskom roku 2006/2007" (PDF) (in Slovak). Ústav informácií a prognóz školstva. Archived from the original (PDF) on July 10, 2007. Retrieved February 14, 2008. ^ "Prehľad stredných odborných učilíšť a učilíšť v školskom roku 2006/2007" (PDF) (in Slovak). Ústav informácií a prognóz školstva. Archived from the original (PDF) on February 27, 2008. Retrieved February 14, 2008. ^ "Dopravný podnik mesta Košice, a.s. – DPMK". www.dpmk.sk. ^ Ján Gana (2007). "Highways and tunnels in Slovakia". Archived from the original on February 1, 2008. Retrieved January 23, 2008. ^ "Košice International Airport – Departures". Košice International Airport. 2010. Archived from the original on July 6, 2007. Retrieved March 22, 2010. ^ "Košice International Airport – Statistics". Košice International Airport. 2010. Archived from the original on October 3, 2011. Retrieved March 22, 2010. ^ "Domov – Košice Európske mesto športu 2016". ^ "Kosice 2016 International City of Sport". Kosice International Airtport. bart.sk. 2012. ^ a b c d e f g h i j k l m n o p q r "Twin cities of the City of Kosice". Magistrát mesta Košice, Tr. Archived from the original on November 5, 2013. Retrieved July 27, 2013. ^ "Sister cities of Budapest" (in Hungarian). Official Website of Budapest. Archived from the original on March 9, 2005. Retrieved July 1, 2009. ^ "Our twin cities – Cottbus". www.cottbus.de. Archived from the original on November 4, 2013. Retrieved June 24, 2013. ^ "Plovdiv Twinning". namrb.org. Archived from the original on December 15, 2008. ^ "Serwis informacyjny UM Rzeszów – Informacja o współpracy Rzeszowa z miastami partnerskimi". www.rzeszow.pl. Archived from the original on April 2, 2015. Retrieved February 2, 2010. ^ "Saint Petersburg in figures – International and Interregional Ties". Saint Petersburg City Government. Archived from the original on February 24, 2009. Retrieved July 14, 2008. Dreisziger, Nándor F. (1972). "New Twist to an Old Riddle: The Bombing of Kassa (Košice), June 26, 1941". Journal of Modern History. 44 (2): 232–42. doi:10.1086/240751. Wikimedia Commons has media related to Košice.